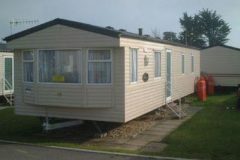 This luxury 2007 model, 3 bedroom, 8 berth Willerby Richmond caravan is situated near the entertainment complex and swimming pools. Haven class this caravan as ‘Prestige’. 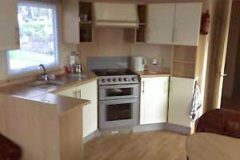 This lovely 3 bedroom caravan is fully equipped with microwave oven, fridge freezer, oven and grill, and TV/DVD. 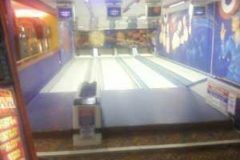 Games for kids and a selection of DVDs are included for our holiday guests. All bedrooms are fully heated and the main bedroom is en-suite. We are happy to assist you with extra help, including pick up from the local bus and train stations if required. We aim to do that little bit more than the large companies. We want your holiday to be special because we care. 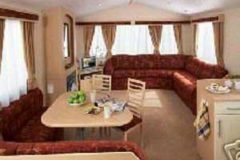 Spacious lounge with TV/DVD player. 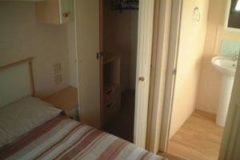 Main bedroom has double bed and ensuite toilet. Other 2 bedrooms have twin beds. The shower room has a heated towel rail and small wash hand basin. Duvets, covers, pillows and cases are all included in the price (changed weekly). If a child's cot or high chair is required a small charge applies.